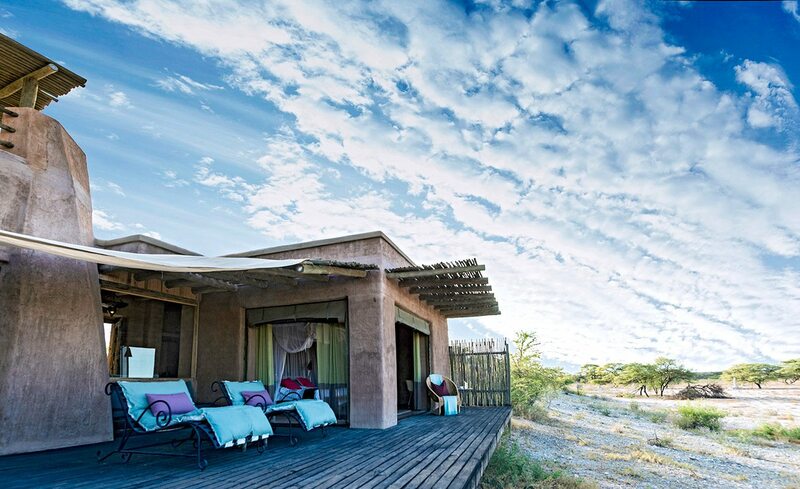 The combination of the flat terrain and the height of the viewing tower at Onguma The Fort means that we spot this luxury Namibian safari lodge from some distance away. Its distinctive stone-clad buildings rise from a grove of camel thorn trees, interspersed with termite mounds that mirror the shape of the tower.Two heavy wooden doors, studded with nails, stand open to welcome us… Beyond, perfectly framed, two armchairs and a seemingly endless vista of the kind that we are coming to associate with Namibia. Between the chairs, a small table holds a drinks tray, and we drink deep from both our glasses and the scenery.Like excited children, we scamper up the stairs of the main tower – from the shaded platform at the top, the views are even more breathtaking. 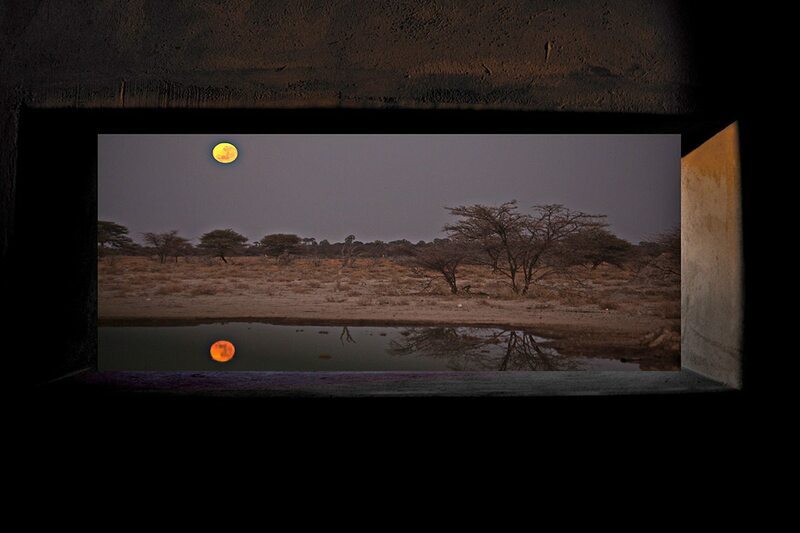 We gaze westwards over the shimmering expanse of Etosha Pan, and the manager, who has climbed up with just as much enthusiasm as we have, modestly claims that in a few hours’ time, this spot will provide the best sunset view in Namibia. We don’t doubt him. 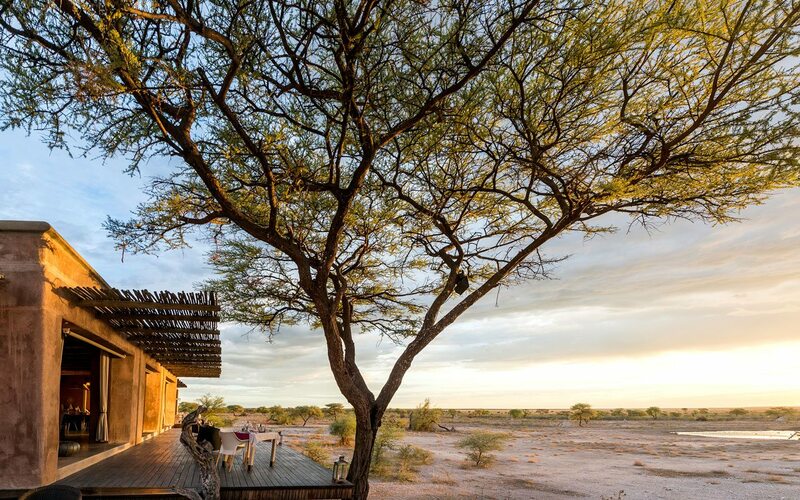 The combination of the flat terrain and the height of the viewing tower at Onguma The Fort means that we spot this luxury Namibian safari lodge from some distance away. Its distinctive stone-clad buildings rise from a grove of camel thorn trees, interspersed with termite mounds that mirror the shape of the tower. 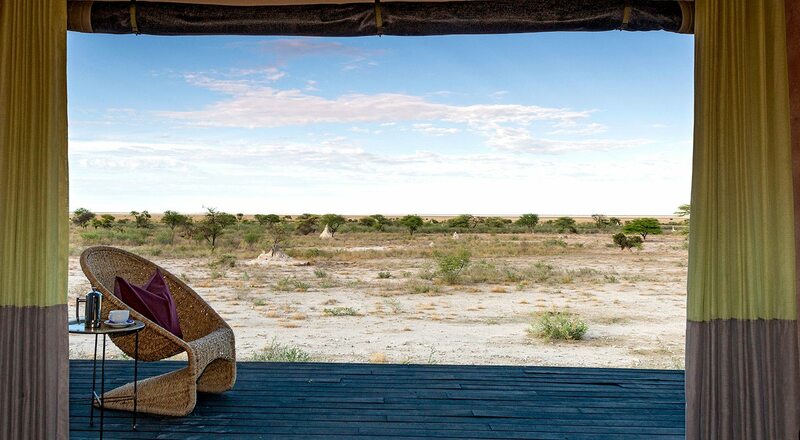 Two heavy wooden doors, studded with nails, stand open to welcome us… Beyond, perfectly framed, two armchairs and a seemingly endless vista of the kind that we are coming to associate with Namibia. Between the chairs, a small table holds a drinks tray, and we drink deep from both our glasses and the scenery. Like excited children, we scamper up the stairs of the main tower – from the shaded platform at the top, the views are even more breathtaking. We gaze westwards over the shimmering expanse of Etosha Pan, and the manager, who has climbed up with just as much enthusiasm as we have, modestly claims that in a few hours’ time, this spot will provide the best sunset view in Namibia. We don’t doubt him. 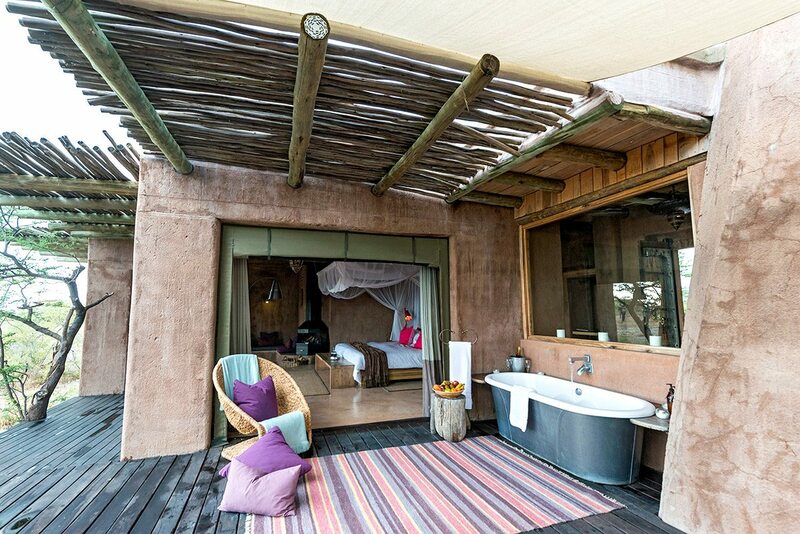 To make the very most of our time in Etosha, we’ve booked the Sultan Suite, which is also in the main fort. 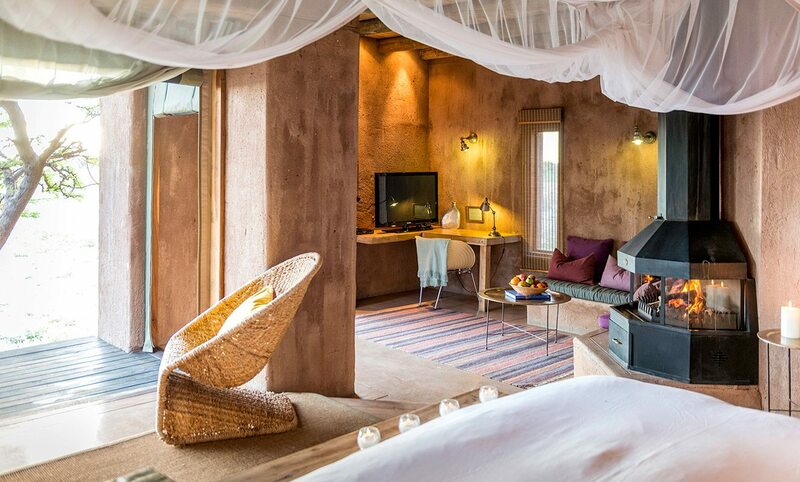 The line of stone suites extending to each side also looks inviting, but who could resist the chance to sleep in a desert fort? Like the rest of the main fort, our suite has a classical African feel, set off by details (including fabulous antique doors and windows) from Morocco and even India. The sense of space mirrors the vastness of the landscape, from our open shower area to the sumptuous lounge that connects the bedroom to our private viewing deck.The fabrics and cushions have all been chosen to pick up on the warm earth tones outside, and we joke that it’s fortunate that we are both so keen to see wildlife, or we might never manage to get out of the large and very comfortable bed… The manager mentions the possibility of a starlit dinner for two in our suite – sold. To make the very most of our time in Etosha, we’ve booked the Sultan Suite, which is also in the main fort. The line of stone suites extending to each side also looks inviting, but who could resist the chance to sleep in a desert fort? Like the rest of the main fort, our suite has a classical African feel, set off by details (including fabulous antique doors and windows) from Morocco and even India. 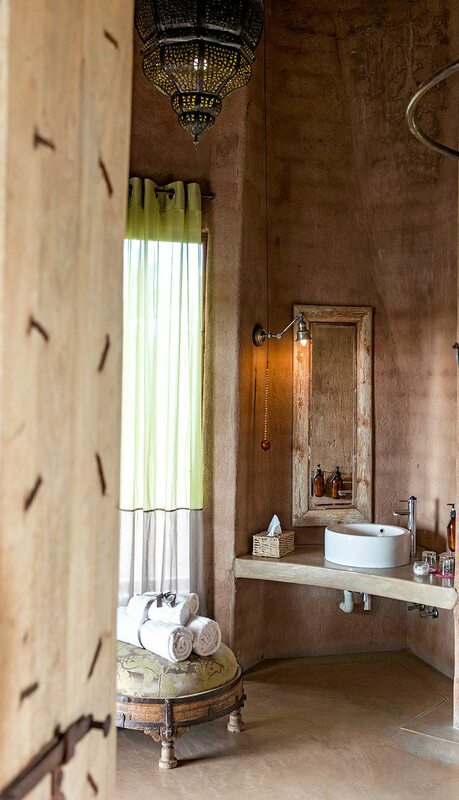 The sense of space mirrors the vastness of the landscape, from our open shower area to the sumptuous lounge that connects the bedroom to our private viewing deck. The fabrics and cushions have all been chosen to pick up on the warm earth tones outside, and we joke that it’s fortunate that we are both so keen to see wildlife, or we might never manage to get out of the large and very comfortable bed… The manager mentions the possibility of a starlit dinner for two in our suite – sold. 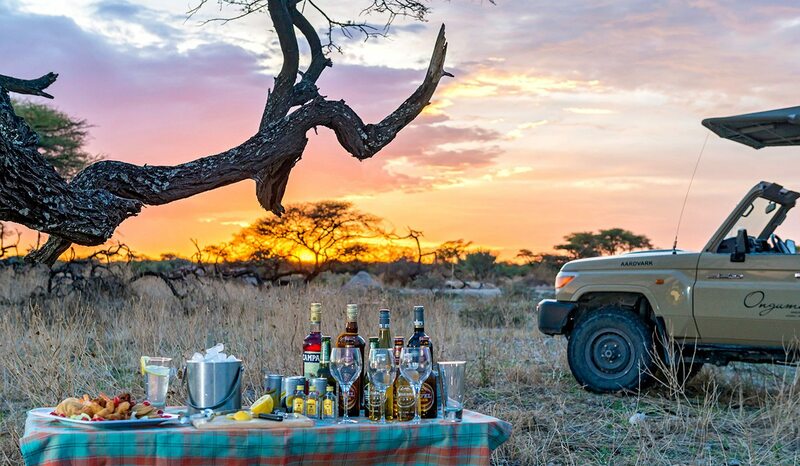 We quickly appreciate that Onguma The Fort stands out quite literally, with its landmark tower, but also for its superb location in the 34,000ha private Onguma Game Reserve, with easy access to the adjoining Etosha National Park. 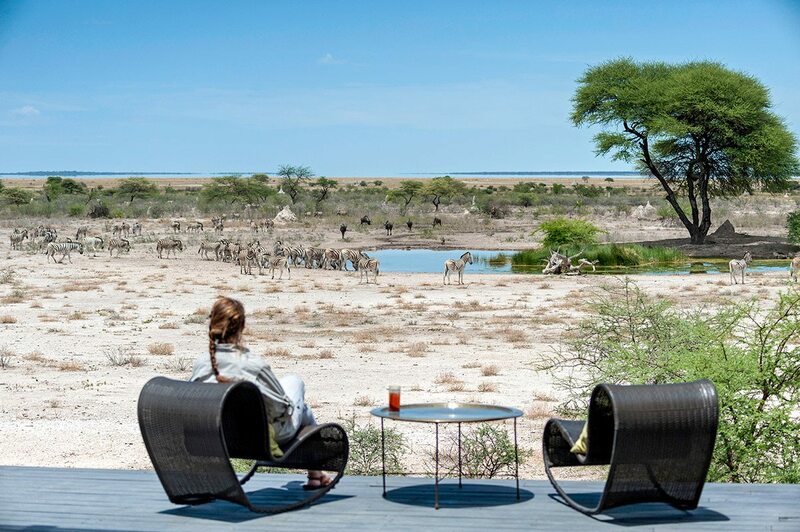 The unique architecture is not at all out of place in the otherworldly landscapes of Etosha, and the design of Onguma The Fort is much more than mere architectural whimsy. We discover that it’s a striking yet very practical way to ensure luxury, seclusion and comfort in this pristine wilderness, while taking nothing away from the expansive views.Game drives in both the private reserve and the national park provide the best possible opportunities to view the wildlife of this dry yet surprisingly rich area, and we’re thrilled to spend time with the newly introduced black rhino. Plus watching wildlife from the hide was spectacular!As for that sunset view over the pans, believe us, it’s going to take some beating! 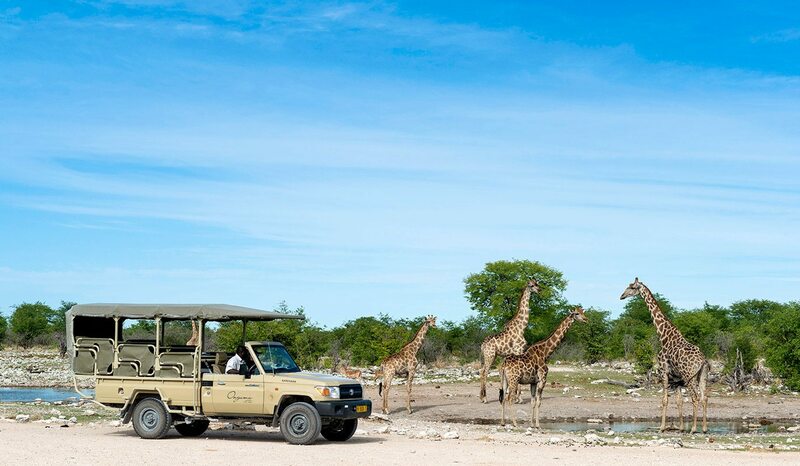 We quickly appreciate that Onguma The Fort stands out quite literally, with its landmark tower, but also for its superb location in the 34,000ha private Onguma Game Reserve, with easy access to the adjoining Etosha National Park. 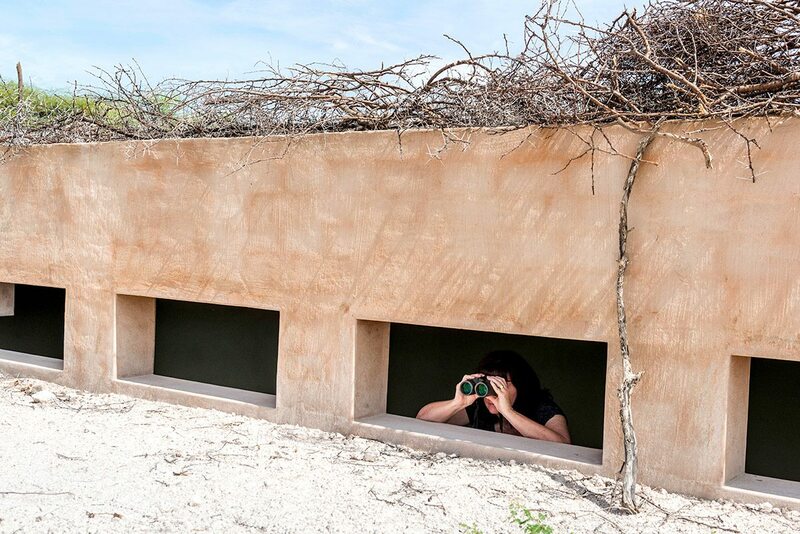 The unique architecture is not at all out of place in the otherworldly landscapes of Etosha, and the design of Onguma The Fort is much more than mere architectural whimsy. We discover that it’s a striking yet very practical way to ensure luxury, seclusion and comfort in this pristine wilderness, while taking nothing away from the expansive views. Game drives in both the private reserve and the national park provide the best possible opportunities to view the wildlife of this dry yet surprisingly rich area, and we’re thrilled to spend time with the newly introduced black rhino. Plus watching wildlife from the hide was spectacular! As for that sunset view over the pans, believe us, it’s going to take some beating! 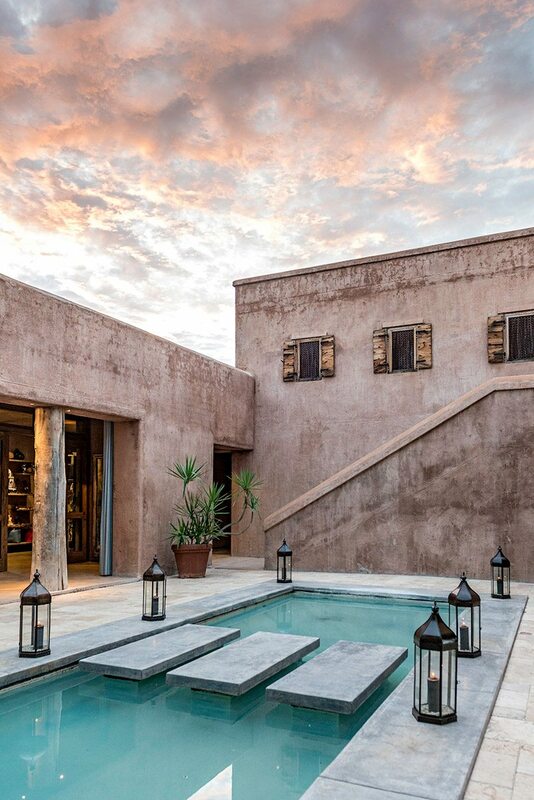 A unique castle-like structure with swimming pool and spectacular views over Etosha Pan. 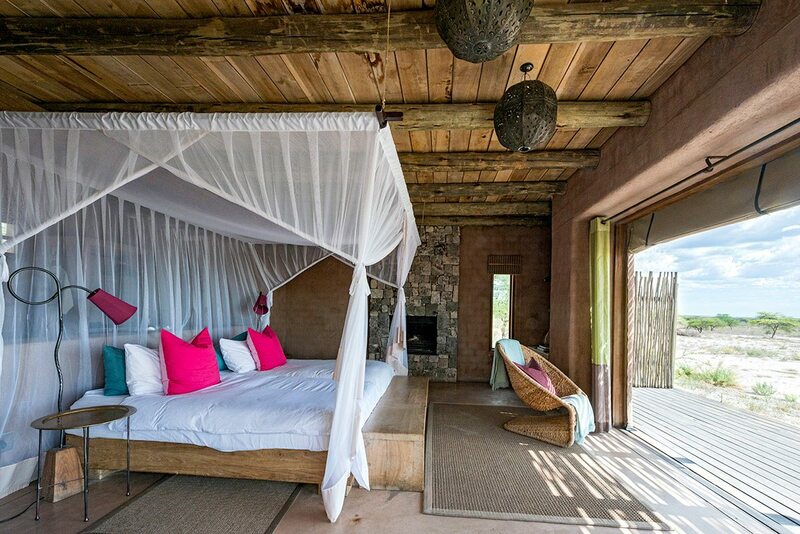 There are 13 luxurious stone suites (including one honeymoon suite). 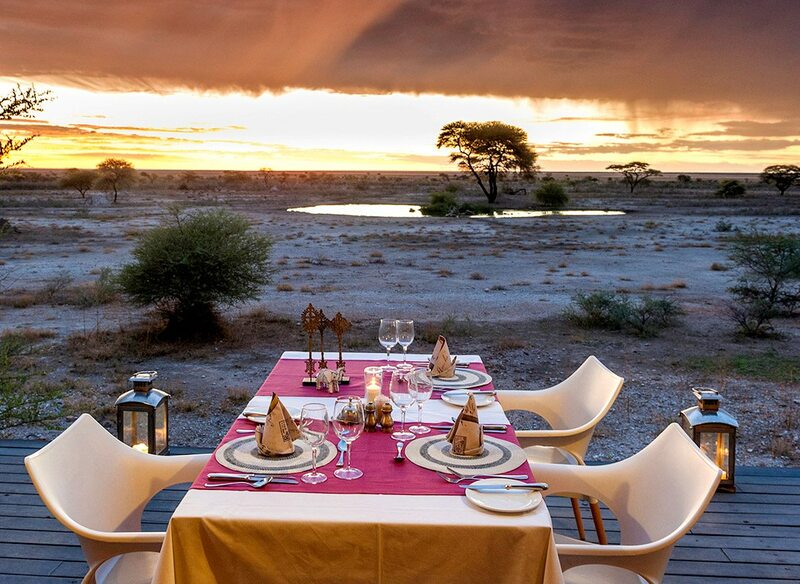 Private game reserve, lodge overlooks Etosha Pan and individual dining. Game drives, sunset drives, interpretative nature walks, scenic flights (additional cost), wildlife hide, waterhole and swimming. Children seven and over are welcome. Children aged 7–11 to share with an adult. Etosha has similar seasons to the rest of Namibia’s interior, which makes the cooler winter months the ideal time to plan your luxury Etosha safari. Watching wildlife at one of the waterholes dotted around the pan is an even more intense experience during these very dry months, as the animals and birds have no other options when it comes to quenching their thirst. Add in crisp mornings, cool evenings and majestic starlit skies, and it’s easy to see why winter is many people’s preferred time to visit Etosha. 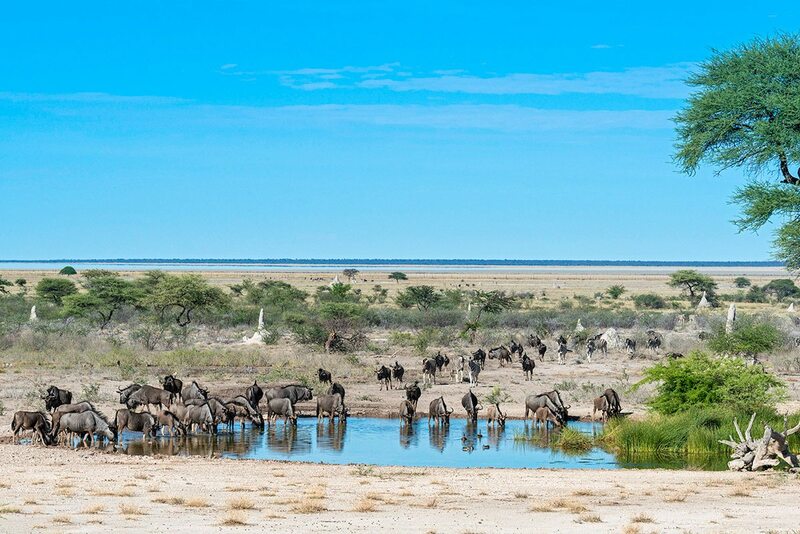 Although less popular, Namibia’s summer can also be a rewarding time for a luxury Etosha safari. While the game disperses when more water is available, any rains that fall can cause magical transformations as water pools and green shoots emerge. 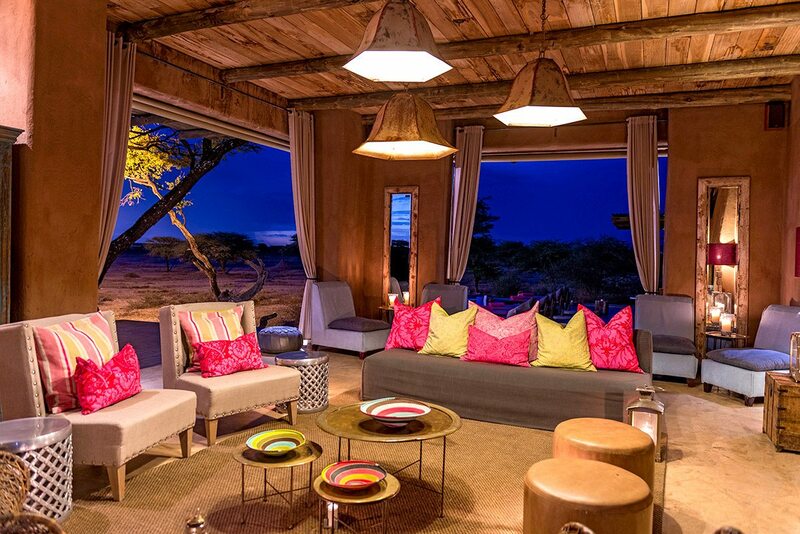 Luxury Namibian safari lodges – many of which are quieter, and offer discounts during the summer months – have many tactics for helping you adapt to the heat, and air-conditioning and swimming pools help greatly. Even in the hottest months, mornings and evenings are pleasantly cool, fine for safaris.